Over phyllo in baking dish, sprinkle 1 cup walnut mixture. Repeat steps 2 and 3 to make 3 more layers (4 layers total). Place remaining phyllo on top of last walnut layer; brush with butter. With sharp knife, cut just halfway through layers in triangle or diamond pattern. Bake in 300° F oven for 1 hour and 25 minutes or until top is golden brown. 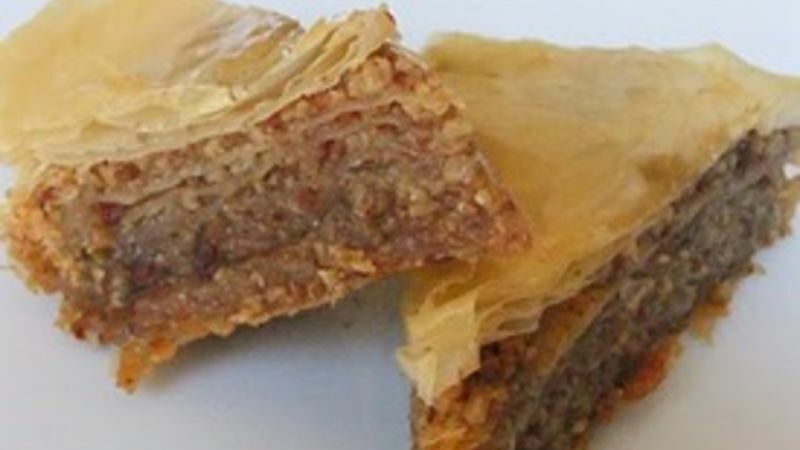 Cool Baklava in dish on wire rack at least 1 hour; cover with foil and let stand at room temperature until serving. To serve, finish cutting, with a sharp knife, through layers to make triangles or diamonds.